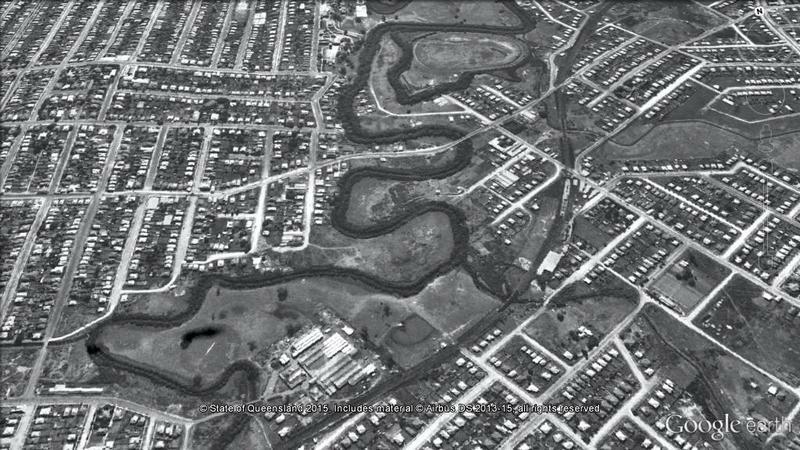 Navigating the history of Norman Creek | There once was a creek . . . While I continue to neglect my own website, I did recently find time to contribute to someone else’s. In collaboration with Trish FitzSimons, who recently produced a wonderful series of short films featured in the Museum of Brisbane’s Navigating Norman Creek exhibit, and with support from the Brisbane City Council’s Community History Grant, I contributed to two pages about the history of Norman Creek for the website of the Norman Creek Catchment Coordinating Committee, or N4C. The first of these two pages explores a plan of Norman Creek drawn in 1839 by the government surveyor James Warner. This plan, held today by the Queensland Museum of Lands, Mapping and Surveying, is a real treasure. It traces the entire length of Norman Creek, from its headwaters in Mount Gravatt to its junction with the Brisbane River. Warner not only depicted the course and form of the stream, but also described the surrounding terrain and vegetation as it was before Brisbane had developed beyond the penal settlement at the site of the modern CBD. His plan links us to the natural history of what is now a highly urbanised catchment. The page, Navigating Norman Creek: Maps from 1839 and 2015, provides a guided tour of Warner’s plan, using Google Earth (in combination with some other special magic) to show how the features on the plan correspond with today’s suburban landscape. The image below is just one example. 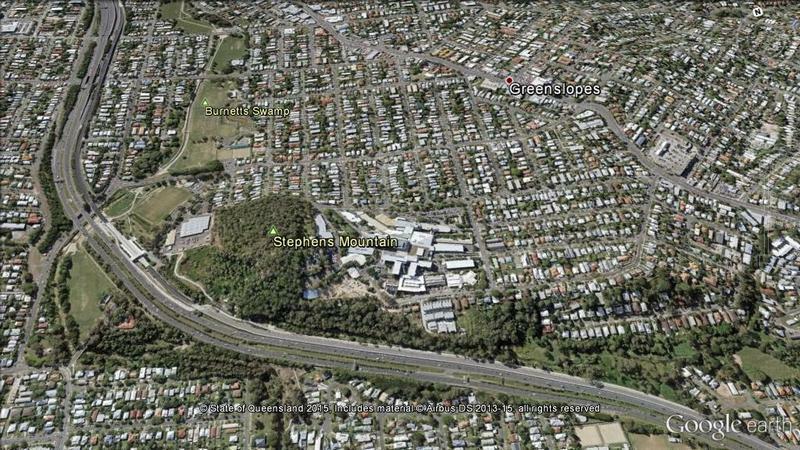 Warner sketched an open forest and a stoney range on either side of what is now the Pacific Motorway as it passes the Greenslopes Hospital. Downstream, he found a large swamp that has since become parkland. The second page explores another slice of Norman Creek’s history, this time via the 1946 aerial imagery of Brisbane. The image below, which will transition to the modern landscape if you hover your cursor on it (or touch it if you are using a mobile device), illustrates the level of modification that the creek has undergone since the middle of the 20th century. 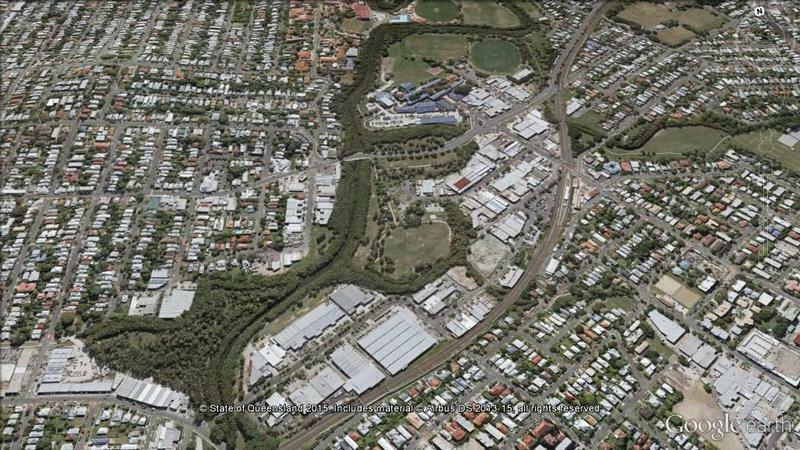 The stretch of Norman Creek between Deshon Street and Stanley Street, Woolloongabba, was straightened during the early 1990s, with several meanders and sharp bends bypassed. Meanwhile, the previously cleared Moorhen Flats has been revegetated. If you’ve been hanging out for some new content here at oncewasacreek.org, I hope these explorations of Norman Creek provide some satisfaction. I can’t promise any more material in the immediate future, but if you happen to be interested in the intersection between data visualisation and the study of public discourse, you might find more joy at my other blog, seenanotherway.com, which has just lurched back into life and is likely to get a lot more attention in the coming months as I enter the next phase of my PhD. 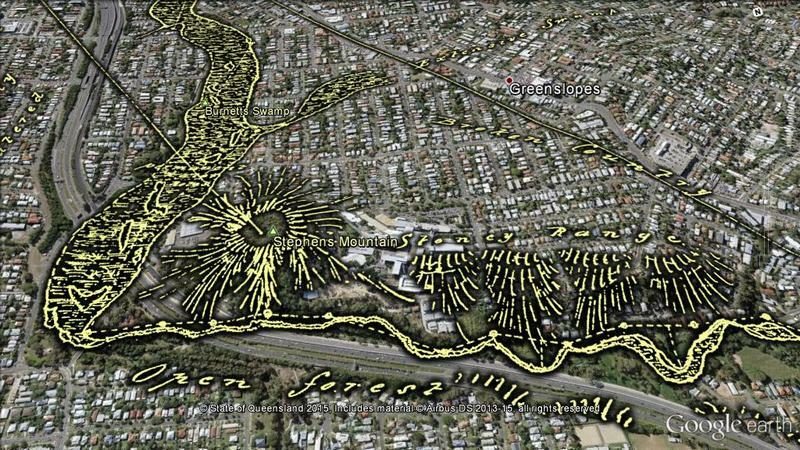 This entry was posted in Other sites and tagged aerial photos, Google Earth, maps, norman creek by angusv. Bookmark the permalink. I can add a little history to Norman Creek. My ancestor William Park Thompson, his wife Mary Elizabeth nee Fraser and three children were brought out to Australia by Robert Ramsay McKenzie and Louis Hope to be the horticulturist at Rosalie Plains station near Dalby. At the time he was head gardener at Park Hill Estate St Vidgeans Scotland near Aberdeen. He was known to Ramsay’s family back int Scotland. They arrived in 1854 and settled in at Rosalie Plains. A daughter born to them ‘Susan Ramsay Thompson’ in 1856 fell ill in 1859 and they were brought down to Brisbane for her medical care but she died in the hospital aged 3. Louis Hope owned land along Norman Creek from where the bridge is on Wynnum Road to and including where Churchie stands today. He leased a goodly section to W P at a peppercorn rent and W P farmed the land. My great grandmother Cecilia Mary Pitt nee Thomson (of Pitts Hotel Cecil Goodna) was born there in 1864. Like all Scots gardeners W P had a really green thumb and was constantly taking out prizes at the Horticultural shows in Brisbane outdoing Walter Hill and Louis Hope in many of the sections. He also grew cotton there which was sent to UK for the postponed great Expo in 1861. We have the the bronze medallions he won for the cotton displayed over there. He grew it where the main oval for Churchie sits today. He tired of farming and went Tin prospecting building two drays one with a store and kitchen on it and the other with accommodation and went to Quart Pot Creek now Stanthorpe where he set up a tin smelter and then travelled further to Emmaville and Tingha where he passed away in 1897. Aside from that, where the the school complex sits at the bottom of the B/W image is where an early racecourse sat called Kempton Park. I have some images of it I use in an powerpoint presentation I have done on early racing in Queensland starting in 1843. Hope you find this of interest. Fascinating stuff, Darcy. I knew from my own research that there had been attempts to grow cotton near the river in Milton in the very early days, but did not know it was grown near Norman Creek as well. I really appreciate your contribution. I knew about cotton being grown in Mt Gravatt and in Beaudesert during the US Civil War (clever entrepreneurs looking to fill gaps in the market from that war I assume). But I had no idea about the Norman Creek flats being used for this purpose. I would love to see a photo of the medalliion. I am just wondering why this isn’t your PhD? It’s really fascinating and you write very well. I stumbled upon your blog as I chased a rabbit down a hole looking for something else. I’m very glad I did. Excellent work, Can I ask how did you acquire the Warner’s Norman creek survey map, the source?